Prime Minister Scott Morrison has used his 'The Beliefs that Guide Us' address to the Asia Society Australia to strengthen the government's pledge to enhance the capability of the ADF and Australia's engagement with Asia. The Asia Society Australia, established in in 1997, focuses on broadening Australia's engagement and understanding of Asian countries, their politics, business and culture. Prime Minister Morrison has used his key note address, 'The Beliefs that Guide Us', to outline his vision for Australia's foreign policy engagement with our region and the government's continuing commitment to enhancing Australia's defence capability in light of the rapidly changing strategic environment. "Our foreign policy defines what we believe about the world and our place in it ... I fear foreign policy these days is too often being assessed through a narrow transactional lens. Taking an overly transactional approach to foreign policy and how we define our national interests sells us short," the PM said, establishing his central thesis for Australia's engagement with Asia. The Prime Minister stressed the importance of the nation's strategic partnerships and Australia's concept of 'mateship' as one of the core foundations for the nation's enduring strategic partnerships with key regional and global partners like the US, UK, Japan, Singapore, Canada, New Zealand and South Korea. "We believe in standing by our mates, side by side with nations that believe the same things we do. From the United Kingdom and the democracies of Europe to the United States and Canada. From the state of Israel to the city state of Singapore. From Japan and South Korea in north Asia to New Zealand, across the ditch," PM Morrison expanded. "The alliance with the United States is a choice we make about how best to pursue our security interests. And US economic engagement is as essential to regional stability and prosperity as its security capabilities and network of alliances." In responding to growing domestic and regional concerns about China's continuing reclamation of land in the South China Sea, the growing military assertiveness throughout the region and colonisation through debt, the Prime Minister was clear in saying that the government was committed to strengthening the Comprehensive Strategic Partnership with China to avoid potential hostilities. Furthering these comments, Prime Minister Morrison was quick to state that while the Australia-China relationship was critical to ensuring regional peace and security, the relationship between the rising superpower and the US was the most pivotal bilateral relationship to ensuring continuing peace and prosperity in the region, and that of Australia. "Inevitably, in the period ahead, we will be navigating a higher degree of US-China strategic competition. A strong America – centrally engaged in the affairs of our region – is critical to Australia’s national interests. At the same time, it is important that US-China relations do not become defined by confrontation," he said. The Prime Minister then went on to discuss the importance of the nation's relationships with key regional partners, including Indonesia, Japan and the broader ASEAN community, and the role each has served in securing peace, prosperity and stability throughout the region. 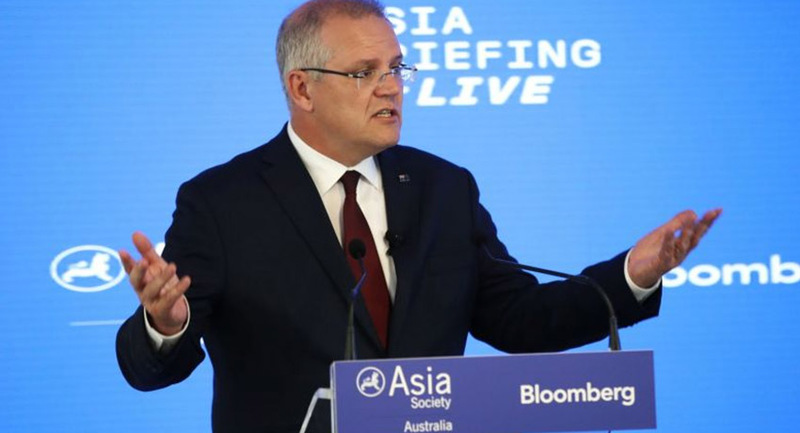 Expanding upon this, Prime Minister Morrison stated that Australia's vision of Indo-Pacific Asia placed ASEAN at its very core. "We also need to think about how our national power can be applied to protect and advance our interests. This begins with our substantial investments in building a more capable, agile and potent Australian Defence Force," he said. Discussing the government's vision for the ADF, the Prime Minister reiterated the critical role the ADF would play in securing both the domestic economic future of the nation, but also its strategic future, reinforcing a commitment to engage in a more meaningful manner with Australia's Asian partners. "We are now undertaking the largest regeneration of the Royal Australian Navy since the Second World War, including the doubling of our future submarine fleet, a new fleet of nine frigates and a new fleet of 12 offshore patrol vessels to ensure our borders remain secure," he said. "The F-35 Joint Strike Fighter program will give the Air Force unprecedented air capability to combat future threats. And the Army is being backed in with new Armoured Reconnaissance Vehicles and new weapons, as well as new body armour and night fighting equipment." Finally, the Prime Minister focused on the importance of not giving in to isolationism, stating that while Australia may be an island, viewing ourselves as disconnected from the economic, political and strategic reality of both Asia and the broader world would be to our detriment. Rather, the PM reinforced his commitment to engage with our region, to build robust, fruitful and reliable strategic partnerships, to the benefit of all. "While we live on an island — the best one on earth — we can’t afford to have an island mentality. We embrace free trade, global engagement and an international system where we agree to rules, stick to them and honour our commitments. We embrace an open, stable and prosperous Indo-Pacific region. Because shrinking into ourselves will never work," he said.